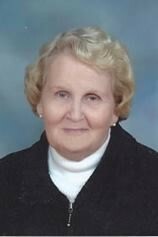 Doloras Jean Hart (DeBrun) formerly of Assumption, Illinois and currently of Joliet, passed away on November 24, 2018. Doloras Jean has been a resident of Joliet for over 56 years. Doloras Jean was born on August 26, 1931, she was the daughter of Matilda (Finnegan) and William DeBrun. Doloras Jean is preceded in death by her husband Ronald Hart, her son Harold Hart, and her daughter Elizabeth Jayne Potter. Doloras Jean has three siblings, her sister Joan and two brothers, Bob and Tom. We are thankful for Tom and Kay Debrun, Bob Debrun and Joan and Wilbur Hish for their love and friendship of our Mother and our family. Doloras married the love of her life, Ronald Hart. Ronald and Doloras were married 41 years before his passing. Doloras is survived by her 4 daughters and 2 sons. Paulette (Hart) and Derek Love, Steven W. Hart, Nancy (Hart) and Leo Stec, Bonnie (Hart) and Ken Klimek, Lynn (Hart) and Charles Frantini and Tom and Patty (Talarico) Hart. At last count Doloras has 17 grandchildren and 19 great grandchildren including many favorite nieces and nephews. Doloras worked at Eliza Kelly School as secretary to the principal. She went onto St. Joseph Hospital in the Pathology Department and helped to start the Cancer Registry. At age 50, Doloras decided to go back to school to become an RN like her mother. She worked at Edwards Hospital and Will County Health Department. As part of her nursing program, Doloras traveled to China and experienced walking on the Great Wall. Doloras also loved visiting the National State Parks around the US. Doloras has been a member of St. Jude Catholic Church since 1962, as a member of the Choir and a Eucharistic Minister giving communion to the elderly and shut-ins at St. Jude. We are thankful for Mom’s friends who have always been there for Mom and our sincere thank you to the Alden of Shorewood East Wing who were loving and caring to Mom along with the Joliet Area Hospice. Our thanks also goes to the wonderful nursing staff at Solstice Senior Living in Joliet.